Domestic violence is a reality for many of today’s youth. But who is to blame? Children become violent when their parents hit them but may also be because they witness a violent relationship between their own parents. These kids grow up with violent tendencies and become a menace to society themselves. 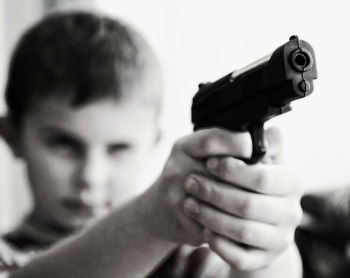 Today, children are also the culprit in most school shootings throughout the country. A simple question parents often ask is, “What does my child need?”Children need a home that is safe and loving and free of violence and parents who protect them. Home should provide a sense of stability, with comfort and support. What might thoughtful parenting look like in homes where violence is occurring? Children who are exposed to intimate partner violence need to know they are not alone and that the violence is not their fault. Children who have one adult who gives them love, support, and attentive care cope better than those who do not. The home should be a place where kids can feel safe and loved – not the other way around. If they feel threatened in their very own homes, how else will they feel out in the big wide world? They will also have a hard time coping with violent situations outside the home – whether it is a crime they have witnessed or have seen someone they know get hurt. Physical abuse, neglect, exposure to parental substance addiction, witnessing domestic violence, abduction and sexual abuse are experienced by children as traumatic events. Add to that list everyday, seemingly ordinary, events, such as seeing a friend hurt; being in an automobile crash; being bullied or watching another child be bullied; learning of the death of a friend, family member or beloved pet; being ignored or dismissed repeatedly when asking for help; being left alone; living in a divorce war zone; and having to spend time with a person perceived by the child as being untrustworthy or dangerous. No parent deliberately exposes his or her children to any of the above traumatic events. Many of us do not consider the way we were raised by our parents to be abusive, much less traumatic. When we were children, some of us were spanked “for our own good.”As parents, we believe, perhaps unconsciously, that naughty children deserve to be spanked to teach them a lesson. However, when a child’s sense of self and psychological safety is threatened by parental deliberate or unintentional acts, those are encoded in the child’s brain as traumatic. And it has a negative impact on a child – something they can carry with them as an adult. In children exposed to trauma, the higher centers of the brain do not participate in decision-making, so fear-based responses prevail. These children may react in a manner out of proportion to a seemingly benign incident. In children exposed to trauma, the ability to self-regulate is weakened. There are environmental factors that also influence the life of a child but parents play the biggest role of them all. Kids with irresponsible or violent parents grow up to be a threat to their own communities. Unfortunately our society today is quick to blame anyone and everyone for the state of our youth. The school system, guns, the media, a chemical imbalance and McDonalds are all to blame for our uneducated, violent, perverted, hyperactive, and obese children. Although these external variables can play a role in shaping our children, at the end of the day, the individuals who most influence children throughout childhood and adolescence are parents. It is parents who mold children, are the navigators of their life, and are the ones who count most. Although this may be obvious, it seems like this idea is slowly being eroded away in the national discourse about children. Parents still matter, and overly emphasizing all these other influences in the talk about children risks chipping away further at the most important player in all of this. The youth is our future. Parents should take the responsibility of rearing them up seriously. They need good role models to emulate as they grow up. Violence among the youth can be avoided if parents supervise their kids in everything they do. Simple things like surfing the Internet can have deadly consequences. The world may be increasingly unpleasant and dangerous for children but if the kids have a good foundation at home, they can navigate their way through life without succumbing to peer pressure or addiction to vices that cloud their thinking and impairs their judgment.